Tag line: "Captured. On Film"
There are few things better than finding a film that blows you away with its ingenuity, which is exactly what 2013’s Afflicted did to me. 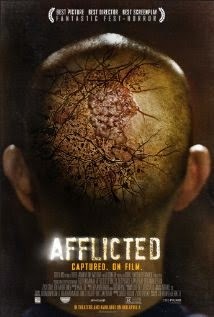 A found-footage style horror flick directed by Derek Lee and Clif Prowse (both of whom also star in the movie), Afflicted approaches its topic from a fresh perspective, and I had an absolute blast watching it. Two best buddies, Derek (Lee) and Clif (Prowse), are about to embark on a great adventure: a year-long trek around the world. Clif, who’s also a filmmaker, plans to record the key moments of their trip, and then post the videos on their blog, which is titled “Ends of the Earth”. Derek, who suffers from a rare disorder of the brain, is especially anxious to get going (his condition is so serious that he could die at any moment). After a brief stop in Barcelona, the pals head to Paris, where Derek meets Audrey (Baya Rehaz), a pretty Parisian girl who accompanies him back to the hotel. To play a practical joke on his friend, Clif bursts into the room hoping to surprise the two, and instead finds a battered and bloodied Derek lying in a heap on the bed. Derek, who can’t remember what happened, refuses to go to the hospital, and in a few days it’s obvious something strange is going on (despite the fact he hasn’t eaten in days, Derek somehow develops superhuman strength). But when he starts craving blood, the friends are forced to confront the very real possibility that Derek is becoming a vampire! Just when you thought the found footage technique had run its course, a creative, energetic movie like Afflicted comes along and breathes new life into it. Some scenes are truly inspired, like one in which the vampiric Derek, wearing a camera that offers viewers a first-person perspective, must jump out the window of his hotel room in the middle of the day, running through the streets of a small Italian town to avoid the INTERPOL agents hot on his trail (like most vampires, Derek’s skin burns up whenever its exposed to sunlight, and this brief sprint causes him tremendous pain). This is but one of many memorable sequences, which range from the amazing (while trying to prove to Clif he doesn’t need medical attention, Derek leaps from street level to the roof of a nearby building in a single bound) to the downright chilling (several days after Derek’s “change”, Clif is searching his darkened hotel room when he makes a terrifying discovery). In addition to the film’s visual treats, Lee and Prowse deliver fine performances (essentially playing themselves) as the two leads, and we care what happens to them (like Clif, we hope Derek will eventually come to his senses and check himself into a hospital). And if you like surprises, Afflicted has a few that are guaranteed to throw you for a loop (make sure you don’t switch it off the moment the end credits start to roll). Like Stake Land and Let the Right One In, Afflicted puts its own unique spin on vampire lore, and in so doing creates a movie experience that horror fans won’t want to miss. Loved this movie! Such a great surprise, and one of the best "found footage" films of all time.